Jordan Zunic claimed his first national trial event title with a two stroke win at the Tasmania Open at the Country Club on Sunday. Zunic, who was runner-up to Nathan Holman at the 2012 Mandurah Open and has recorded nine top-10 finishes in the last twelve month in main amateur events, fired rounds of 70-69-67-65 to finish at 13-under, with Daniel Hoeve runner-up at 11-under. “It was nice to finally get a win,” said Zunic, ranked 39th in the world amateur rankings. Zunic is a prolific worker of the game. For a number of years he’s fine tuned his game under the watchful eye of Warwick Drews and Matt Howe. Zunic has won a number of junior events, including the 2010 NSW Junior Boys Championship, yet it was at the 2012 Australian Amateur where he came onto the main amateur scene, reaching the semi-finals after accounting for Geoff Drakeford and Ben Holis in earlier rounds before Daniel Nisbet ended Zunic’s run. Zunic then followed the Australian Amateur with reaching the top-32 at the British Amateur championship and continues to go from strength to strength. “Hopefully, this will lead to more wins,” said Zunic. The win is also timely for Zunic with the prized Riversdale Cup in Melbourne less than a fortnight away. “My confidence is right back,” says Zunic who also recorded top-10 finishes at last year’s Scottish Open and St Andrews Links Championship. 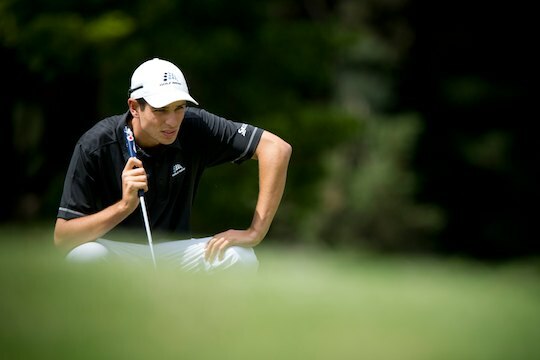 France’s Teremoana Beaucousin and South Australia’s Christopher Brown finished in a tie for third position at 8-under with Queensland’s Cory Crawford in fifth position at 7-under. Defending champion, Ricki Kato finished in a tie for 14th position at 5-over-par.